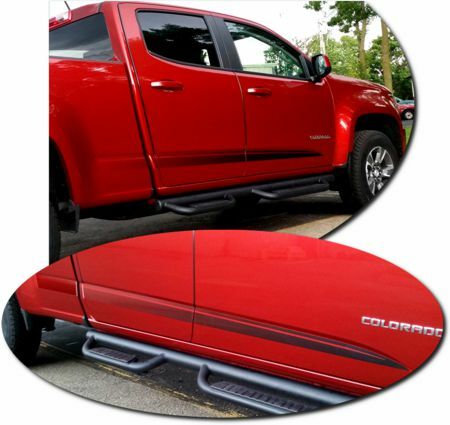 Add a unique look to your '15-Current Chevrolet Colorado or GMC Canyon! This great-looking body side graphics kit is designed to fit perfectly on your Colorado/Canyon's lower door panel areas as shown. Starting solid at the front, the easy-to-apply graphics gradually fade to the rear. Available in four (4) print colors (Black shown), kit is precut - NO TRIMMING required - and is set to be placed as recommended on our Parts List. These graphic kits are vehicle specific and will not fit any other vehicle.